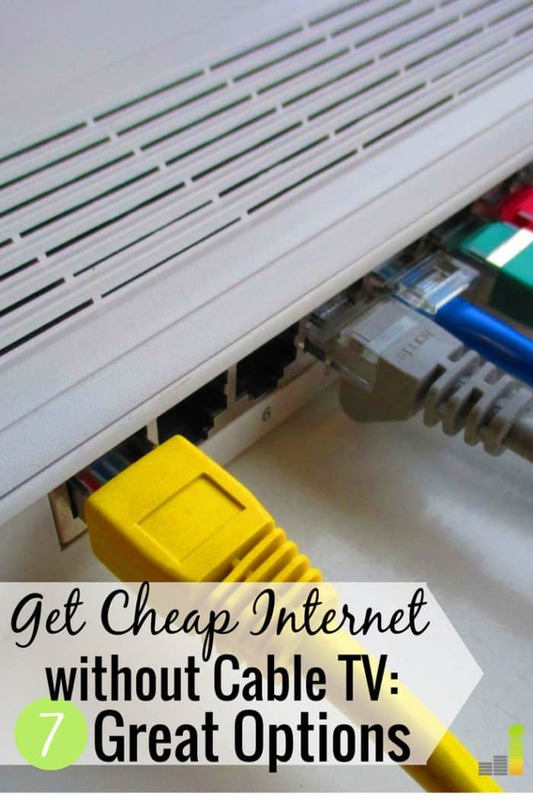 Cutting the cord is one of the best ways to save money on a regular basis. However, a common problem cord-cutters encounter is how to get Internet without cable TV. This issue continues to plague those who want to cancel cable because many cable providers like to bundle Internet with cable plans. This is done for two reasons – to make us believe we’re saving money and to keep their cable subscription numbers up. If you’ve been trying to determine how to get Internet without cable or a phone line you’ve likely had the same frustrations. We got to deal with this recently on a call to negotiate a lower Internet price. The salesperson tried to upsell us to get cable and a phone line, by telling us we could bundle to save money. We’re concerned with just having affordable Internet access and, of course, did not fall for their sales tactics. Making the frustration worse, there’s a lack of competition in the broadband service space. This makes it increasingly more difficult for those trying to figure out how to get wireless Internet without cable. A 2014 study by the U.S Department of Commerce reveals only eight percent of Americans live in an area that has access to high speed Internet. Unless you live in an area that has multiple Internet service providers you likely face a monopoly when trying to save money. This makes it harder to save money, but it’s not impossible. 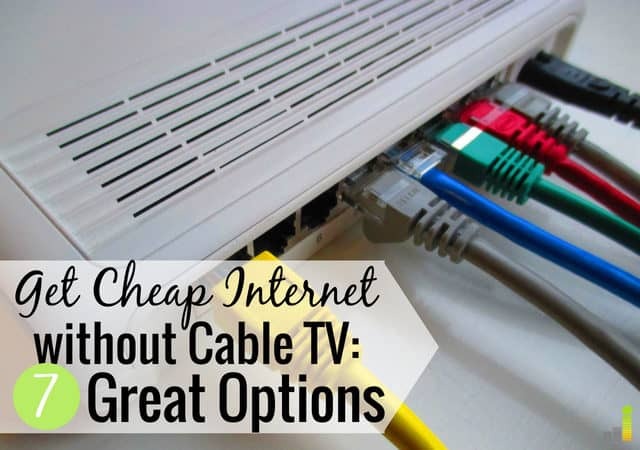 If you’re asking yourself “How can I get Internet without cable”, this post will give you the available options to get Internet without cable and save more money each month while still getting to watch all the shows you want. Many want to know how to get Internet without cable. Thankfully there are ways to get Internet without cable TV but it does take work on your part to find the best option. In our case it was actually quite simple to get Internet without cable TV. We had DirecTV, which was separate from our Internet service. The combined bill was roughly $200 per month. We canceled DirecTV to lower that cost. Here’s how to cancel DirecTV if you have the service and want to save money, which halved our monthly cost. The challenge many people face when trying to get Internet without cable is breaking free of the bundle. Your provider may try to convince you there are no ways to get Internet without cable or a phone line. There are many options to consider and some that provide great service. Yes, there are challenges, such as if you stream a lot of content or live in a rural area. Still even in those circumstances, it is possible to get wireless Internet without cable. What is the Average Internet Cost Per Month? You want to make cutting the cord worth it. In certain instances the math may not make it feasible to cut the cord and still stream. You want to balance not having too expensive of a plan with not subjecting yourself to buffering while streaming content. The average Internet cost is just over $60 per month, according to USA Today. We pay roughly $70 per month for our Internet service as we have a faster service since my wife and I run our business from home. That is really the upper limit of what we’re comfortable paying. You want to find a good balance that still provides enough room to purchase the content you want to watch. Many of the best cable TV alternatives are reasonably priced, but you don’t want the combination to cost more than having cable would entail as you’d lose money each month. If you want to cut the cord on cable and want standalone Internet service, here’s how to get Internet without cable. The best Internet Service Provider in my area is AT&T. As you may know, AT&T owns the DirecTV family of satellite and streaming providers. They also offer standalone wireless Internet across much of the country, in addition to phone services. AT&T Wireless is $40 per month for speeds up to 50 Mbps per month. AT&T does offer higher speed plans, but that commonly involves bundling with phone or satellite and can frequently change. If you can live without either, the $40 plan should serve your needs. As you will see, AT&T does not offer service across the country. That is not uncommon with service providers. Thankfully it’s not difficult to get Internet without cable as there is decent overlap of the country in terms of providers. If you live in one of the above States, you can check for availability to see if you can get coverage. The cheap Internet service providers we mention in this post are both affordable and provide quality service. The monthly charge does not translate into poor service as the market will only bear a certain price. While there is fair overlap across the country for ISPs you may notice that not each State has a good Internet service provider. This post is meant to be a reference for the best Internet plans available for home users. If you have a good ISP to add to our list, please list it in the comments. Here are the best cheap Internet service providers to help you get wireless Internet without cable TV. FreedomPop offers wireless Internet through a hotspot. A hotspot allows you to get Internet coverage whether you’re in a public place or are mobile. Basic Plan: The basic plan at FreedomPop is free of charge. That’s correct; they allow you to get free Internet service. The catch is they just offer 500MB of data per month with the basic plan, and any additional data is charged at $.02 per MB. This plan only offers access to their 4G network. Pro500 Plan: The Pro500 Plan is the same plan as the Basic plan, but with a twist. You get access to both a 4G and 3G network. You get the same 500MB of data per month, and additional data is $.02 per MB. The charge for the Pro500 plan is $3.99 per month. Premium 3GB Plan: This plan is the first significant bump up in data allowances. The Premium 3GB plan offers 3GB of data for $28.99 per month and offers access to both their 3G and 4G network. You pay an additional $.015 per MB you use each month. Premium 4GB Plan: The FreedomPop Premium 4GB plan offers 4GB of data for $34.99 per month. You pay an additional $.015 per MB you use each month and get access to both networks. Premium 5GB Plan: The FreedomPop Premium 5GB plan offers 5GB of data for $39.99 per month. You pay the same $.015 per MB over that allowance you use each month and get access to both networks. Premium 10GB Plan: This is the biggest plan you can get with FreedomPop. You get 10GB of data per month, on the same two networks for $74.99 per month. You also pay the same overage charge of $.015 per MB used, as found in other plans. FreedomPop offers coverage in most of the country, with significant limitations in Nebraska, North Dakota, South Dakota, Wyoming, and Montana. Check your availability to see if FreedomPop offers coverage where you live. Comcast is well-known among the cord-cutting community as they offer cable in much of the country. They do also offer standalone wireless Internet that does not require a cable contract, through their Xfinity Internet plans. Comcast does offer numerous plans, depending on your level of need, location, and whether or not you have cable. The Internet only plan is $39.99 per month, for 60 Mbps. You can connect up to five devices at one time with that plan. $49.99 per month, which includes 10 TV channels. Those channels are largely local, and requires no contract. You also get 100 Mbps for download speeds. This plan also works for up to five devices at once. $69.99 per month, which includes 125 TV channels. This plan works for six to eight devices at once. One thing to keep in mind with this plan is that it requires a two-year contract. Comcast does have fairly wide availability, with plans in the following States: Alabama, Arkansas, Arizona, California, Colorado, Connecticut, District of Columbia, Delaware, Florida, Georgia, Idaho, Illinois, Kansas, Kentucky, Louisiana, Massachusetts, Maryland, Maine, Michigan, Minnesota, Missouri, Mississippi, North Carolina, New Hampshire, New Jersey, New Mexico, New York, Ohio, Oregon, Pennsylvania, Rhode Island, South Carolina, Tennessee, Texas, Utah, Vermont, Virginia, Washington, West Virginia, and Wisconsin. You can also purchase data for $12 per month per GB. If you prefer unlimited data, you can get that for $45 per month per line. They operate on the Verizon network, so it’s quality coverage. Google Fiber is one of the more intriguing ways to get Internet without cable or a phone line. They’re synonymous with the Internet so it stands to reason that they’d offer decent service for those wanting to save on their Internet costs. Google Fiber primarily offers two services: Internet and television. Their plans vary based on where you live, with some locations requiring a television package to get their higher tier Internet packages. Here is where you can currently find Google Fiber: Atlanta, Austin, Charlotte, Chicago, Dallas, Denver, Huntsville, Jacksonville, Kansas City, Los Angeles, Louisville, Miami, Nashville, Oakland, Oklahoma City, Orange County, Phoenix, Portland, Provo, San Antonio, San Diego, San Francisco, Salt Lake City, Seattle, and Tampa. It’s important to note that some of the locations only offer access if you live in an apartment or condo. Google Fiber offers up to five plans (all with no contract), with the two below being their basic plans that do not require you to also get television. Fiber 100: The Fiber 100 plan costs $50 per month, with up to 100 Mbps in speed. You do not have any data caps with this plan, nor others, and can download an HD movie in under ten minutes. You can also use up to five devices with this plan. Fiber 1000: The Fiber 1000 plan costs $70 per month, with up to 1,000 Mbps in speed. Like the Fiber 100 plan, this plan has no data caps, and you can use up to ten devices with this plan and download an HD movie in under a minute. Verizon Fios is an arm of telecom giant Verizon that offers Internet-only plans. While you might suspect that Verizon Fios would be in a lot of locations, that is unfortunately not the case. Unless you live on the East Coast, you won’t be able to get service from Verizon Fios. As would make sense, this plan costs $39.99 per month. Verizon Fios gives you up to 100 Mbps with this lower tier plan. This plan is an exclusive deal you can only find on the Internet though it does, unfortunately, require a one-year contract. They do offer a two-year contract, for $10 less per month as they waive the setup fee. Like the other plan, the charge for this plan is a straightforward $79.99 per month. The $79.99 plan provides a speed of 940/880 Mbps. Also like the other plan, it requires a one-year contract with the option of an extra year by waiving any setup fees. Charter Spectrum is another standalone wireless Internet provider that has a fairly wide reach. They just list one plan on their site, which is $39.99 per month for 60 Mbps. While this plan requires a 12-month commitment, it does come with a free modem. You can check the details of the plan and see what specific plans they might offer in your area by checking here. Charter Spectrum has fairly wide availability, with plans in the following States: Alabama, Arizona, California, Colorado, Connecticut, Florida, Georgia, Hawaii, Idaho, Illinois, Indiana, Kansas, Kentucky, Louisiana, Maine, Massachusetts, Michigan, Minnesota, Montana, Nebraska, Nevada, New Hampshire, New Jersey, New Mexico, New York, Ohio, Oregon, Pennsylvania, Rhode Island, South Carolina, South Dakota, Tennessee, Texas, Utah, Vermont, Virginia, Washington, West Virginia, Wisconsin, and Wyoming. You may be surprised to find a DSL provider on the list of best companies to get Internet without cable. DSL Extreme is on this list because they operate on the AT&T U-Verse network, allowing them to offer faster speeds. Like a few of the other providers, their plans vary based on where you live. Their standard plans offer 24 Mbps for $52.95 per month and 45 Mbps for $62.95 per month. As with other plans, DSL Extreme does require a 12-month commitment. DSL Extreme has more limited availability than some of the previous providers. DSL Extreme offers plans in the following States: Alabama, Arkansas, California, Florida, Georgia, Illinois, Indiana, Kansas, Kentucky, Louisiana, Michigan, Missouri, Mississippi, North Carolina, Nevada, Ohio, Oklahoma, South Carolina, Tennessee, Texas, and Wisconsin. You can check plan availability here. You may have different options when trying to figure out how to get Internet without a cable company. Some options may simply be a DSL provider, and others may be a genuine, standalone wireless Internet provider. The best way to find Internet providers in your area is to check the FCC’s site. You can check it here. Just type in your address, and it will return the Internet providers in your area. Be aware that the site will show both wireless and wired providers in your area. As with any decision like this, make sure to compare available providers, what plans they offer and if the plan will meet your needs. There are many standalone Internet service providers in the space, so you want to ensure you find one that meets your needs. Many of us have come to depend on fast Internet service to meet their needs. We personally run a business from home that depends on fast Internet, so it obviously is something we care about greatly. Other families have a lot of streaming needs, so they need a big data allowance to cover those needs. You may have different needs, so it’s important to ask questions before deciding on an Internet service provider. What download speeds can I expect? This is likely the most important question to ask a provider. Just because they advertise that a plan has “up to” a certain speed does not mean you will get that speed. You want to ask what level of speed they can guarantee. If it does not meet your needs, then you need to look elsewhere. Do you have a data cap? The last thing you want to do is run into a situation where you’re charged a crazy overage fee or something worse. Make sure you explicitly know what data caps they have. If it’s too restrictive, then you need to choose another provider. What happens at the end of the introductory period? Providers of all stripes like to market a product with a low, introductory price. Check pricing at multiple providers so you can arm yourself with information. The last thing you want is to see pricing double after a year because you didn’t ask about introductory pricing. Internet service providers, like cable companies, are fee-happy. The quoted price often does not include additional costs like taxes, equipment fan installation fees, and service charges. When comparing providers, you want to ask what your initial upfront cost will be along with your monthly charge. Cable and Internet companies often make it difficult and expensive to cancel service. Ask each provider you compare what costs you will incur if you choose to cancel. Don’t forget to ask what to do with any equipment you have from the provider. They often require it to be returned upon cancelation. Make sure to ask what they expect back without being charged. Should I buy my own router or modem? Don’t overlook this question. Many providers will give you the necessary equipment, but it often comes at a cost of $10 or $20 per month. That can add up over the course of time. You can buy your own router or modem but make sure to ask if it will work with their service. Buying your own router or modem is not a cheap expense, but it can save you money over the long-term. Just make sure to buy the newest available product to ensure you get the best possible speeds, along with a longer lifespan. Here are the best routers from Amazon if you choose to buy your own. Many choose not to cut the cord because they fear they can’t get Internet without cable. That is not the case as there are many standalone wireless Internet-only service providers in the space today. There is a lot of homework to do before taking the plunge. There are many providers to wade through, and you want to find the best possible plan for your needs. Cutting the cord is a good thing, but you want to do the math to make sure you find the lowest-cost possibility that will still meet your needs for both television content and Internet. It is possible to get Internet without cable or a phone line, and when you find the right match, it can save you significant money each month. What are some other ways to get Internet without cable or phone line? What cheap Internet service providers offer the best service in your area? How much do you spend on cable and Internet each month? Thanks so much for sharing this! I hate the upsell that many companies use. We’ve never paid for cable unless it was part of our rental agreement, despite internet provider pressure that we would save so much more if we added cable we don’t use. Not a problem at all Meghan. We hate it as well. We got the upsell hard a few weeks ago when we called to negotiate a lower price for our Internet service. They just don’t get it, much of why it’s a dying beast. This is my biggest frustration with cutting the cord, which I did last April when I moved into my new condo. Spectrum charged me $45 a month for my internet then but of course as soon as the 1 year intro pricing was up it shot up to $65. ATT is the only other internet provider worth anything in our area and my particular condo building has had poor service with them. Definitely hurts my efforts at saving money by cutting the cord. Spectrum is unfortunately our only option in our area of Louisville, KY. I was paying $45/mo when it was TimeWarner. As soon as my contract was up after Spectrum took over, they upped it to $60/mo. and then 3 mos. later, to $75. They should literally lose their license to do business. They’re little more than crooks. Sorry to hear that Sandie. Unfortunately, that’s far too often a case in this industry. I live in North Benton Ohio and I use CenturyLink. They have an Internet only plan it gives us 60 GB for $55 per month for life and with no data cap to boot. That’s right I said for life. We are a small town but fortunately we have fiber optics. The only catch is that you must order your service over the internet you cannot do it over the telephone. Not quite sure the reasoning behind that but I don’t care because it saved me $105.00 a month right off the top, and unlike Armstrong or as we like to call them, Strongarm, they actually give us what we’re paying for and more. We run at least 25 devices off of our connection and have never suffered buffering problems or slow internet. We did splurge on a Google 3-piece mesh system and we now have the best internet that we’ve ever had since we’ve lived here for the last 30 years. I know that CenturyLink has a bad reputation in some areas But not here. Their customer service is top-notch and they actually answer the phone. We had one small problem with our modem / router on the router side and when I spoke to the nice lady at CenturyLink she advised that she would have one out to our house in 3 to 5 days which didn’t matter because we had already installed the Google mesh system, and the new router arrived in two days anyway. We couldn’t be happier and I can guarantee you we will never miss a payment. Even with a couple of Premium services like Netflix, Hulu, and YouTube Red our bill is just shy of $80 a month And we have all the entertainment choices that we want. With Armstrong we were paying $185 a month for internet and cable TV and that was mid-tier with no premium channels at all. In some areas such as larger cities you can get up to a hundred G a month. It’s an option well worth checking out because it saved us a bundle. Nice work on the savings William! We have DirecTV and ATT landline, both of which I want to get rid of. But I’m confused as to what is best way to go so as to get channels which includes Discovery, History and HBO channels (mainly what we watch). As far as phone’s, I have been a Net10 subscriber for a few years now as I don’t like contract service tho I realize that I may have to go to some type of yearly contract for internet/TV. Those are both very easy channels to get with a streaming provider. Philo and Sling TV are the best, cheapest options you’d want to look at. For phone, Republic Wireless, by far, is the best no-contract option in the space. I have CableOne. My husband and I didn’t have cable for a very long time, until they introduced datacaps and we were forced to upgrade 3 times. After the 3rd upgrade, we were looking at 250 bucks a month for internet alone. I had to bundle cable in order to get a cheaper rate. I miss just having internet as I really don’t watch TV. Currently use DirectTV via satellite which I want to cancel. But haven’t had internet other than streaming via phone and tablet with TMobile (in rural NE TN.) Already carry Prime, but although TMobile allows streaming ‘for free’ there have been issues with buffering. From your articles, I think I’m getting the hang of all of the layers. 2). Other than local via streaming through Hulu, Sling or DirectTV Now. To clarify, I would need to also need to add an ISP service in order to gain access much like an atenna to get local? Great questions Cindy & sounds like you’re on the right track. 🙂 Yes, you can get locals with an antenna. But, in most cases, Hulu Live will provide locals and is our favorite streaming provider. Yes, you would need an ISP to get Internet service. To tell if you have a smart TV, simply go to “settings” on your TV. If you see “WiFi/Lan” as an option then you’re good to go. If your TV was made in at least the last 6 – 8 years, it’s a smart TV. Depending on the manufacturer it can even be older and still be smart.